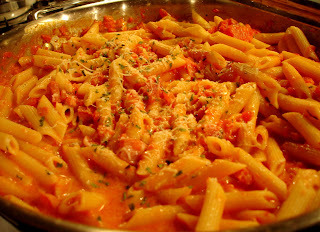 Penne Vodka is something I love to order in restaurants, but I've never made it myself. Last night Jenny and Stacey came over so I decided to try out a new recipe on them. Luckily it was fabulous!! Isn't it so pretty? While the pasta is cooking, heat olive oil in a pan. Add the garlic and meats; cook, stirring, over medium heat for 3-5 minutes. Pour the whole tomatoes with their juices into a food processor. Using the pulse button, chop them. You want to be sure not to continuously chop them as this will aerate them and turn them pink. You learn something new everyday! Add the tomatoes to the pan with the garlic and meat. Season with salt and red pepper and bring to a boil for 2 minutes. Lower the heat and pour in the vodka. Allow this to come to a lively simmer, then reduce to a simmer until the pasta is almost done. Before adding the pasta, slowly stir in the cream. Add the pasta to the sauce, add the cheese, and top with parsley. I wouldn't make any changes to this recipe at all. I cannot wait to dig into the leftovers for lunch today! Wow that looks good right now!